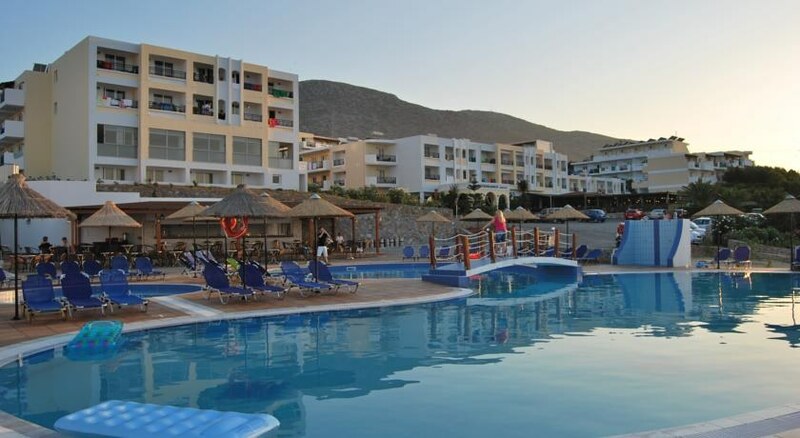 Mediterraneo Hotel is a modern family friendly 4-star hotel located in the sunny resort Hersonissos, within walking distance from the elegant beach which is a polular spot for thrilling water sports. Featuring a mini water park, a lovely restaurant, a mini market and a souvenir shop, the hotel looks forward to welcoming guests with its array of modern amenities and warm, subtle hospitality. A total of 230 rooms and 62 suites of the 4-star accommodation are spread over numerous small bungalows and thus provide perfect retreats and a pleasant stay for every family. Situated in close proximity to the town, well-appointed guestrooms provide panoramic views of the sea and come with air-conditioning, a refrigerator, safe box, satellite TV/music channels, free Wi-Fi, en-suite bath or shower and hair-dryer. This is an oasis of privacy, calmness and luxury in charming Hersonissos. 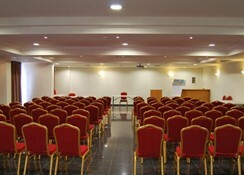 Mediterraneo Hotel is about 1 km away from the golden sand Star beach. The hotel is close to most tourist attractions in the area like Lixnostatis Folk Museum (2.6km), Aquaworld Aquarium (2.7km), Acqua Plus Water Park (7.1km), and Labyrinth Park (6.5km). The Heraklion International Airport is at a distance of 27km from the hotel and the hotel can arrange for transfers to and from the airport. All rooms at Mediterraneo Hotel are air-conditioned and come with a private balcony with gorgeous sea or side sea views. These come with air-conditioning, safe box, satellite TV/music channels, en-suite bath or shower and hair-dryer. Mediterraneo Hotel has a main restaurant MEDITERRANEO which serves delicious Greek, International cuisine in a scenic ambience of sea & pool view. Expert chefs dish out a variety of cuisines made from the freshest of ingredients, for breakfast, lunch and dinner in buffet-style. There is a snack restaurant serving snacks, salads and light bites, a main bar to relax with cocktails and two pool bars. The hotel has two swimming pools, two kid’s pools and terrace. There is a fully equipped gym for those who wish to stay active. There is a lovely spa with a steam room, jacuzzi offering massages and therapies. Tiny tots can have fun at mini waterpark or Playground. 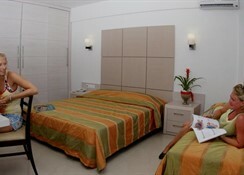 The hotel has facilities for Beach Volley, Darts, Football, Table tennis, Tennis, Games Room and Billiards. Guests can also shop at the minimarket on-site. The location of this hotel is great the beach opposite and the all the shops and restaurants ect only 10 min walk at tops. Hotel itself is good but the rooms away from main hotel are quite bad a 2star at a push for those rooms! Apart from that very good.